At Sam’s, our goal is to provide an inviting atmosphere to our customers, and a healthy workplace for our team members. We want to be a bridge that people can walk across to meet their daily needs. Our biggest priority is making sure we do our work with good intentions, and honest approach, and the determination to help our community. We are people of integrity, and treat our customers with the respect we know they deserve. The Owner of Sam’s Locker Boise. Sam was raised in Idaho with several siblings. His family instilled in him the belief that community is of paramount importance. In his early adult years, Sam chose to serve our country in the U.S Marine Corps. After military service, he continued to serve as a contractor, doing many tours overseas in support of the U.S. war efforts. During that time, getting home to his family and his community became a top priority. Once home, Sam opened his first pawn store in 2014, and through his dedication to helping people, and providing stellar service, grew his company into Idaho’s premier pawn service. Sam’s passion for pawn stems from his understanding that real community means helping one another, and that’s exactly what sets Sam’s Locker apart from other services. For Sam, money and profit will always be prioritized well after making sure his customer’s needs are met, and they are satisfied. Now that Sam’s time in uniform is over, his new mission is to build a legacy of service to his community at home. Sam is also very dedicated to his fellow veterans and raises money for local veteran’s non-profits. Additionally, Sam has employed (and still employs) several disabled veterans, knowing very well that sometimes veterans thrive best around other veterans. Sam’s brothers and sister in arms will always have a special place in his heart, and in his life. So, when you come down to the shop on Fairview and see the dollar bills taped to the walls, and the charity jars stationed around the shop, know those things are symbols of Sam’s commitment to his fellow veterans and feel free to participate however you see fit. 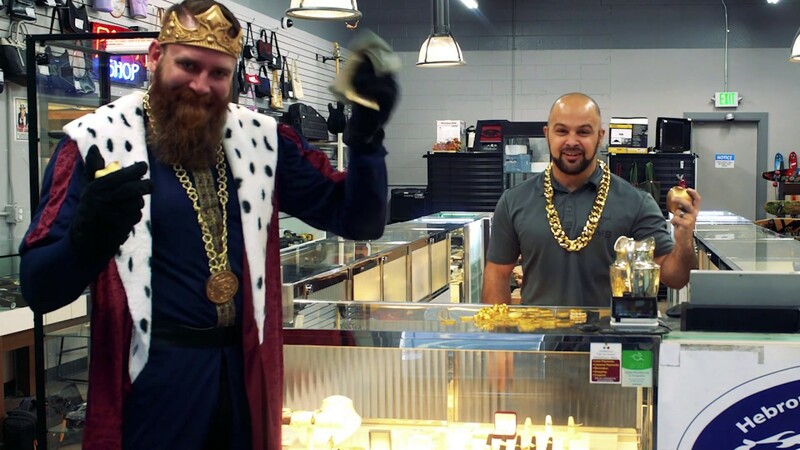 Sam’s Locker was formed in late 2014 when its founder, Samuel Reading, decided to turn his attention to the Pawn industry. Sam’s desire to pawn didn’t originate from a childhood dream, or a long thought out and formulated business plan. Rather, it came from a variety of goals and desires that came together at the right time, including his persistent dream of becoming a business owner. Sometimes the stars align and things just fall in place. Hard work, and the patience to wait for the right moment made Sam’s Locker a reality. Sam has always believed that having good intentions in your endeavors is the foundation of living a good life. We all make mistakes; some are greater than others, but how we learn from those mistakes is what shapes our future. We built Sam’s Locker to reflect this core belief with everything we do. Although we often deal with people in difficult positions, it is beyond important to do the right thing, keeping both parties’ interests in mind. This belief is the foundation of every transaction and is demonstrated throughout our entire process. At Sam’s Locker our goal is to help people through their hardships, not make things more difficult. To that end, we offer as many options as we can to help people find solutions. Our flexibility is one of our greatest assets. We are flexible because we really care. It’s because of these principles that we’ve found a place in our great community, and it’s because of these principles that we believe Sam’s Locker is a great place for you to find the solution you are looking for. Welcome to Sam’s, how may we be of service to you? EVERY YEAR WE RAISE OVER $2,500 FOR THE IDAHO VETERANS NETWORK, WHO ADVOCATES, SHARES INFORMATION, AND SOLVES PROBLEMS FOR VETERANS AND THEIR FAMILIES IN CRISIS, AND SUPPORTS EACH OTHER. When I first met Sam Reading, of Sam’s Locker Pawn in Boise, I was an administrator on a large Facebook Buy/Sell/Trade page. One of the other administrators introduced me to Sam, and told me Sam was a young veteran who was starting up his own pawn business and needed some help driving traffic to his store, and his web page. We assisted in making that happen by means of our Facebook page. Over the last three or so years since then, Sam has become a good friend of mine, and someone for whom I occasionally do some writing work. On one such occasion last year, I mentioned to Sam during one of our meetings that the Idaho Veterans Network had put me in touch with the right resources to win my disability claim with the VA . After many years fighting for benefits, within just a few months of seeking the direction of IVN and it’s affiliates, my case was settled in my favor. Sam is a veteran who was blessed to make it through his overseas tours with the military, and as a contractor, without much physical ailment. However, some of his friends weren’t so lucky, and Sam asked if I could put them in touch with the same resources that had made me successful in closing my case favorably. I agreed, and one by one IVN put Sam’s friends in touch with the resources that they needed to help them. This caught Sam’s attention and he volunteered to start raising donations for IVN through his Pawn shop. In 2018 Sam’s efforts raised between $2,500 and $3,000 dollar for IVN, and Sam has implemented a long-term fundraising mechanism through his business to try to donate even more funds for 2019. The funds Sam’s efforts have raised are routed directly through IVN to veterans in need of therapy that the VA does not provide, and towards providing for weekly peer-to-peer meetings for combat veterans. When I first met Sam, I was a veteran who was simply in the right place to help another veteran. Later Idaho Veterans Network put me in touch with other veterans who have helped me on my way. Now, Sam’s successful business is in a place to give back to the community and as a veteran himself, vets are a cause that is close to his heart. His efforts, and the efforts of all of the IVN community partners are greatly appreciated, and exemplify the core values of the Idaho Veterans Network, and perhaps they best exemplify the most important value our community can have: the idea that veterans ought to be helping other veterans whenever, wherever, and however we can. At the end of the day, if we don’t take care of each other, who else will be there to do it? We are our brothers’ and sisters’ keeper. A big thanks to Sam for being part of the IVN family, and for setting such a great and generous example. Are You Ready To Get The Best Deals Ever? This Pawn Shop in Boise Idaho is at your service! Visit our stores and get a loan, or sell your items to us or buy from our huge collection of merchandise. WE HELP MAKE THE WORLD A BETTER PLACE ! Copyright © 2019. All rights reserved by Sams Locker Boise.